Watercolours and coffee paintings 5 x 7 are $30.00. 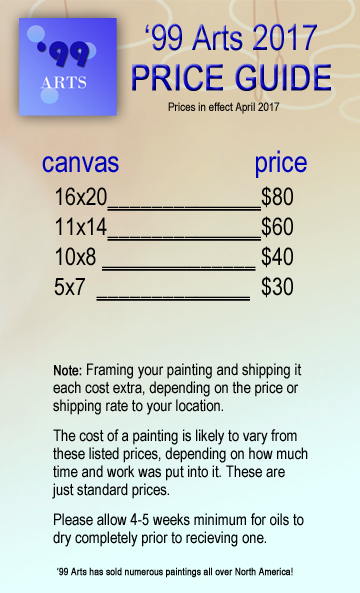 *Prices can vary depending on the amount of detail and time it takes to produce the painting. *All prices may vary from $40 to $100. Oil paintings take at least 4 weeks to dry, Acrylic paintings are dry when the painting is finished. Note: Extra cost for frames and/or shipping. Price range: $$$, $$$$, and $$ for select items.